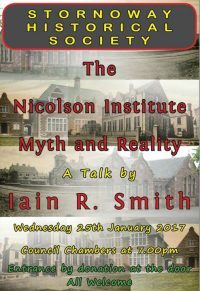 I dragged along a friend and we went to the January lecture entitled, “The Nicolson Institute: Myth and Reality,” delivered by Iain R Smith, which can be viewed online Here. Neither myself or my friend ever made much of an impact in the roll of Nicolson Institute graduates, but others certainly did. One of the graduates, I discovered, was a Donald Mackenzie who became a lecturer at Princeton University many years back! These lectures are far from dry history. They are engaging, informative and full of humour. For anyone from Lewis & Harris, or from elsewhere and interested in Island life, the lectures are well worth attending. If you can’t manage to attend any of the lectures in person, it is worth following the work of the Society online.